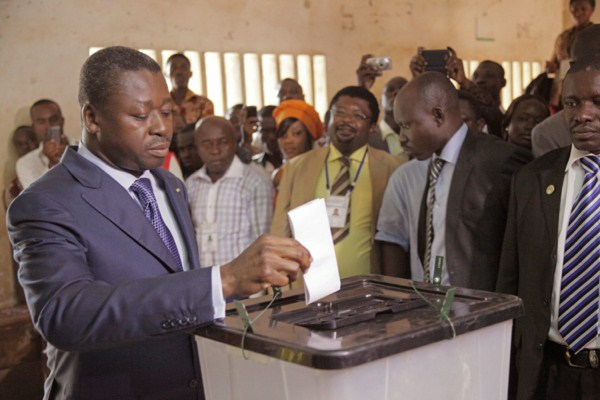 Togo President Faure Gnassingbe casts his ballot in the city of Lome, Togo, July 25, 2013 (AP photo by Erick Kaglan). On April 15, exactly 18 days before the end of President Faure Essozimna Gnassingbe’s second term in office, Togo will go to the polls to elect its next head of state. In power since the death of his father, Gen. Eyadema Gnassingbe, in 2005, Gnassingbe will be running for a third term as president. Though permitted by the 2002 constitution passed by his father, which removed presidential term limits, his candidacy is nevertheless contested by the opposition, concerned by what it calls the “confiscation of power” by a man whose family has ruled the country for over 40 years.